Eating Jamón Ibérico de Bellota cold is like drinking a warm glass of Champagne. If only one thing were to be said about how to enjoy a jamón Pata Negra, it would be this: “Enjoy at room temperature”. In order to enjoy to the fullest the flavors and aromas of an authentic Acorn-fed Ibérico Ham, it’s crucial to taste it at room temperature. This is around 70 degrees Fahrenheit (21 degrees Celsius). This is the ideal temperature for the ham to “sweat”. Sweating is when the fat from the acorn-fed Ibérico ham starts to melt and maximizes all the flavors and aromas of this delicacy. If the temperature is too high it can affect the flavor of the ham, and if it’s too low the Oleic Acid from the fat won’t melt and won’t maximize it’s flavor. You can get our Pata Negra in two formats: the whole ham or the hand carved package. Whole Ham: Use the ham holder and knife provided when you buy our whole ham (www.ibericoclub.com/buy) to carve thin and bite-sized slices. Then place them in a white round plate and leave them 3-4 minutes at room temperature. You’ll see how each slice releases the characteristic aroma and flavor of the oleic acid from the acorns. 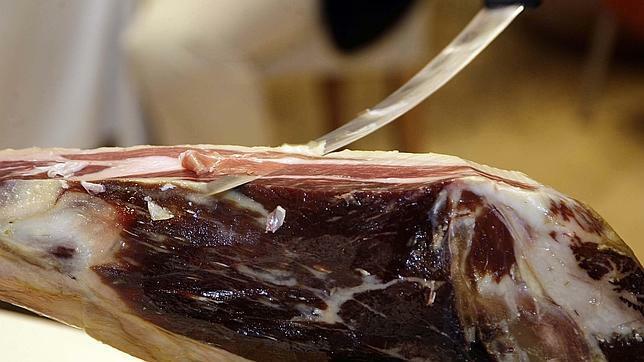 Hand carved and Packaged: This is one of the most popular ways to buy our unique jamón Ibérico de Bellota. Our carving Masters in Córdoba, Spain have been carving jamón for generations and will make the most out the ham. They carve slice by slice, place them slightly overlapped in a white tray, and vacuum seal the package to maintain the freshness. You just have to know a couple of things to enjoy our Pata Negra from the package. When you receive the package at home, store it in the fridge at 32-41 degrees Fahrenheit. And when you are ready to consume it, take it out of the fridge 30 minutes before opening to let the fat get the ideal room temperature. Then open the vacuum seal and separate the slices one by one and put them in a white round plate and leave it for 3-4 minutes before consuming. Can’t wait to open it? 2.- Take the package out of the water, open it, and put slice by slice on a plate. Another method, sometimes used at restaurants, is slightly heat the empty plate and then place the slices of ham in the warm plate (not hot, just slightly warm). You’ll see how the acorn based fat starts to turn transparent and melts, giving the ham it’s unique flavor and aroma. Our recommendation is to be patient and let the ham gradually get it’s ideal temperature for consumption. More tips and info about our unique Jamón Ibérico de Bellota.